So, here we are. We have come so far and accomplished so much, yet there is still more to do. Incredibly enough, the game now has a title and game over screens. Yes, that means that you can now finally, truly, die in Particle Paradox. Yes, that is the name, and we are sticking with it. Speaking of being able to die, we now have a new enemy designed to kill you. That's right! A blue triangle exists now that can fly and impede your path above while rolling triangles impede your progress on the ground. Fun! In addition to the title screen, game over screen, and new enemy type, Toby Giant (the player character) now has new animations for being hit, and pushing particles on the ground and in the air. Hoo-ah! With that done, we still have a few more things to do before the end of the week to prepare for our demo and presentation. Ideally, we would like to have our demo level built, a better background, music, and better looking platforms. 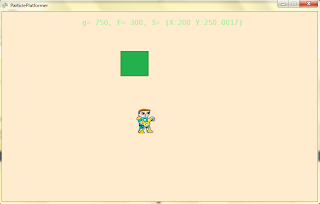 As you can see, we want to focus on the demo level for the presentation. Depending on how much time we have between making the final report and preparing the presentation, we may make it so that the flying triangle can shoot lasers. We could potentially also improve the background and platforms further. Either way, that is the mid-week 9 update. Brace yourself for the end (of the demo) for we are coming in hot and will likely need firefighters and paramedics standing by when we land. So, right now we have "an interesting tech demo ... [that] looks like the very beginnings of a great game." (Frank Lee) Our current objective is two-fold: to add more content (such as music and flying enemies) and to create a single solid level for our presentation. We also have to actually make said presentation, which is somehow due Monday of week ten, but that's besides the point. So that Acho doesn't think I'm being over confident, I'll also mention that we have to make the particles do more things, like double jumping, in order to make the game more interesting. Questions? Comments? Concerns? As we move into the final stages of our proof of concept development, we appreciate your input. You can contact us at particlesofchaos@gmail.com, or you can attend the presentation during week 10, which will take place sometime between 3 and 5 on June 8th. (We'll have Q&A, I promise!) Until then, happy particling! P.S. We might have a download of our game in the final update, i.e. next week. We think it would be really swell, but it's not a guarantee, so don't get your hopes up too much. You see: A long time ago, a man once said that a post would be made in the not-too-distant slightly-distant future that would enlighten the trillions of followers of this blog. My friends, that time could possibly be now. As of this moment, the brave team of Machan Horenker working on the PARTICLE PLATFORMER project have finally overcome their ignorance and made it so that collisions with enemies are registered. In addition, more content has been poured into the feeding trough called the screenshots/videos page. So consume away and devour our tasty morsels that we provide for you. You need us. Now that we have established who is the boss here, let's get into the big update. Increased particle control is now available to you, the player. That's right, we are empowering you. Can you handle the power come 20XX ? When the world will enjoy the delicious taste of Particle Platformer. The camera control is now at DEFCON SWEET, which if you ask me, is pretty freaking sweet. The camera now adeptly follows the player no matter where they go. Fun stuff. I just want you people to know: This is happening. This is not a dream. This is not a test. This game can be ready. It probably will revolutionize the world, but worst case scenario, it will just blow the minds of all 5.8 trillion Particle Platformer fans and all 0.00000001 haters of the Particle Platformer project. New screenshots and videos have been added for the project. View, laugh, love, and wait for the next update. Once upon a time, it was foretold that enemies would come to challenge Toby Giant, the particle man. That time is now. The basic Triangle enemy has come to the particle platformer, and he is ready to party! This triangle enemy will roll along on the ground and injure the player if they come into contact with it. You read that right, roll. It is a right triangle also. Something to note: we don't have enemy collisions working quite yet, so currently the triangle will just roll past the player like he is late to his business meeting, and Toby is that one guy waiting at the bus stop in the background while this clearly busy triangle goes somewhere. Until he hits a block. Then the triangle turns around, because we have enemy-block collisions working. end note. In un-enemy related news, the player can now shoot particles to a desired location, meaning that we basically have the "push" particle ability working. We also have the camera partially working so that it kinda follows the player so that they can move around freely, and don't have to worry about losing the character if they run off the screen. We've completed all of the week six objectives, which include the ability to display particles, collision detection, and upgraded character animation. Basically, we achieved this by lowering our standards. 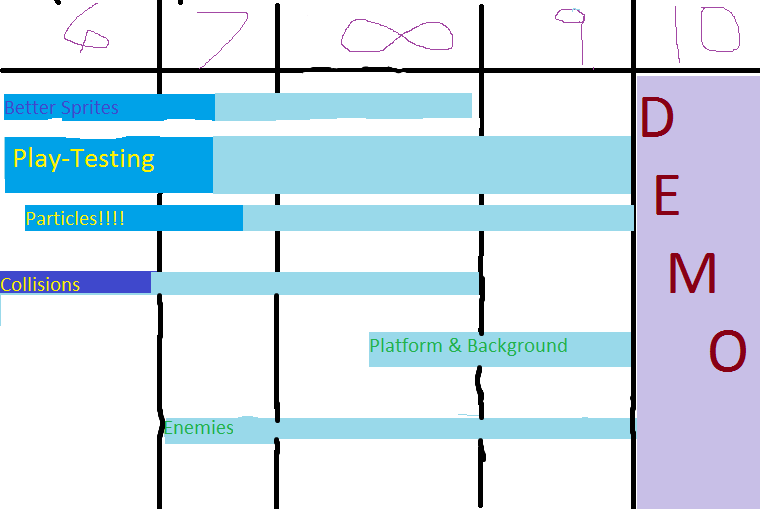 In the old schedule, we were supposed to have a working game by this point so that we could start making levels, puzzles, and bosses. So now we're instead going to try and just have working game in time for the demonstration in week ten. Right now, we basically have the ability to run around and jump on platforms; in addition, we have particles that follow the player and have the ability to disperse via right clicking. (They also follow the mouse as long as left click is held down.) Also, I've just been informed that a minor bug with collision detection has just been fixed, so collision detection is now working absolutely perfectly, so that Toby can crash into things like a boss. Muhahahaha! In addition to all that awesome stuff, we're nearly finished with making a vector of walls, which will allow us to have many platforms to crash into instead of just one. We also have a cool background. These things aren't supposed to be done until the end of weeks 7 and 8, respectively, hence the excitement about now being slightly ahead of schedule. Once the aforementioned vector (or, as C# calls it, a list) is completed, we should be able to add camera scrolling fairly easily, so we should have a game that's dramatically good-looking inside of two weeks. Enemies and the ability to blow them up will then be the only things left to accomplish. So, yea. Awesome sauce. Note that each week lists the work that will be completed by the end of that week. Also, per our instructor's request, we have a Gantt chart this time; it's below the regular schedule. I have just been informed that "Particles are kind of working". That is all. Hey! Check it. 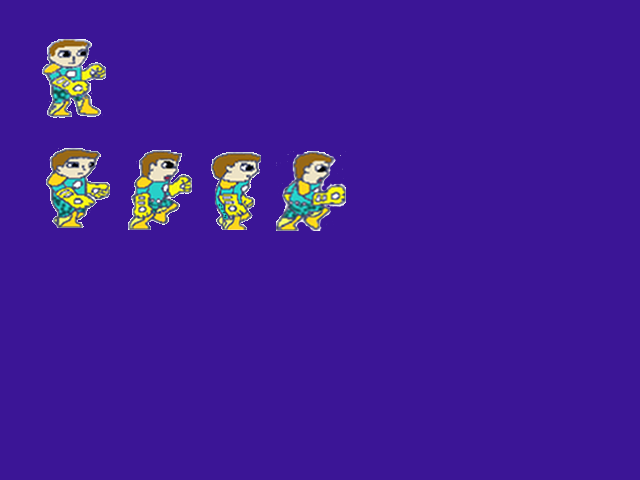 We now have a player character who runs. Runs like no-one has ever run before. He high-steps for the future, he high steps for you and me, he's a high-steppin' hero who can and will save the world. Don't believe me, Check out the pics VIDEO if you don't believe me. Isn't that awesome? He can run like a man now, a grown, strong, man. Who will one day control manly particles of pure manliness that will allow him to fight the much less masculine geometrics for the fate of the universe. Did I mention that we are actually writing a story for this game? That's right. The head writer is even me, the guy who just three different derivatives of "manly" in one sentence. Needless to say, this script will be special. Also, I should point out that the whole point of this post is to alert our many fans that we now know how to do animation somewhat competently, so look out Blizzard. We are coming for you! This week, we got kicked out of the learning terrace! Actually, there was a fire, so the building was evacuated. Exciting stuff. 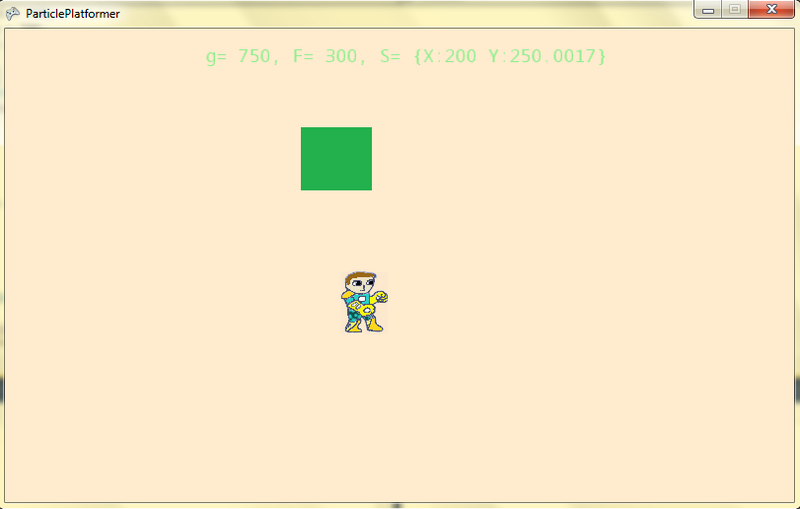 So in a study room in Millennium, we managed to dissect pieces of a C# platformer tutorial program. We have a particle class that's close to working, a map class that should let us piece together levels pretty easily, and we're in the process of animating the character's movement. We're also on the verge of totally epic collision detection, so we're pretty excited about that. Meanwhile here's something to chew on: our brand new sprite sheet!!! He's almost at the apex of his jump in this particular shot; it's a lot smoother when you can see it move. The green text at the top is for our debugging purposes and won't be in the final game. It displays things like the coefficient of friction and acceleration due to gravity. Anren was working on a function that let us change these things in-game, but we're putting it off until we have a game that's worth debugging and are done reconfiguring the player class where all that data is stored. So yea, things are pretty cool this week.